I absolutely love The Hunger Games by Suzanne Collins. It was most definitely a page turner that kept me at the edge of my seat. Hunger Games is a dystopian young adult novel with an excellent plot and story line. The book is centered on a sixteen year girl, named Katniss, that steps forward to take her sister’s place in the annual Hunger Games, a televised survival war in which only one can win out of twenty four. Katniss must overcome various obstacles if she wants to win or see her family again. Katniss is a well developed character that doesn’t seem to know who she is or what she wants—typical to the average teenage girl. Brutality, politics, romance, and death are a few words that summarize this book in a nutshell. Although this novel is mainly about kids murdering each other to stay alive, Collins manages to keep you so enthralled that you look past how vicious and insane the whole idea is. I was so engrossed in this book that I totally forgot that it is a YA (young adult) novel. The age group recommendation for Hunger Games is 12 and up, which I feel is appropriate since the main characters are teenagers. This book is well written, but an easy read in which the words just seem to speak volumes to you. One just has to think how Collins came up with it all, because the plot was perfectly paced and dynamical. As an aspiring teacher, this will definitely be a book I suggest my students to read. There are so many fun things you could do with this book and although it isn’t a canonical text it could easily be paired up with books like The Lord of the Flies or Animal Farm. Pairing classics, that must be taught, with YA novels can really get students interested into reading and a great way for teacher to get students to analyze similar books. There are so many underlying themes in this book such as power, control, money, and loyalty, just to name a few. Collins definitely delves into the future, but politics and self -consuming individuals–which is big in today’s society– definitely has a major role in this book. Collins delivers tons of messages in this book. I am itching to go out and buy Catching Fire and Mocking Jay right now and can’t hardly stand that I am so late on this book. 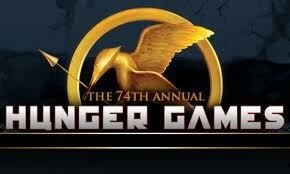 I am officially hungry for Hunger Games! Previous Where is my Little Brother? Next Social Networks in Classrooms….Really? Hello Osman, I’m still working on the response it’s a little sketchy to me, but thank you for commenting!! !